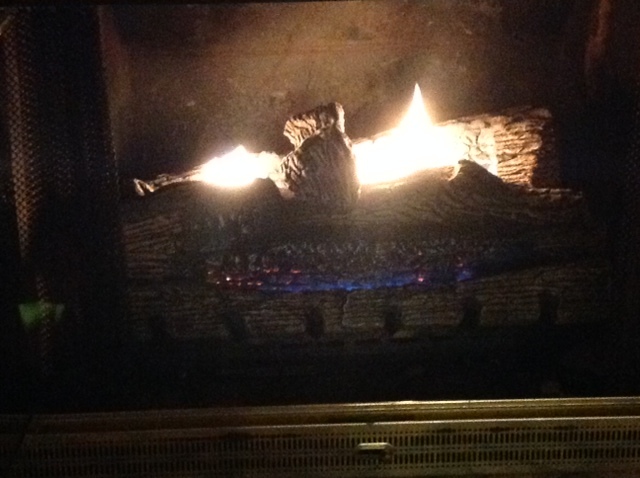 A couple of nights ago, while my wife was in the room she calls the library (and I call her nest), watching recorded television programs, I listened to music for a while, then started a fire in the fireplace. The fireplace is a propane-fueled, gas log contraption that only recently became usable, thanks to delivery of two new hundred-pound tanks of propane and a bit of wizardry (working on the pilot light and flame control settings) by the delivery guy. The fire produced in the fireplace is decent, I suppose, but it’s readily apparent it is not a wood fire. The flames are too uniform, the colors too consistent, and the wonderful aroma of wood smoke completely lacking. But it’s a fire. Fireplaces can set romantic moods, especially if they are wood-burning, smoke-producing, good-smelling, warmth-creating, and instead-of-TV-watching. It’s been years since we had such a fireplace. And that was in a suburb of Houston, Texas, where wood-burning fireplaces compete with ski-shops for practicality and relevance. Here, in the shadows of the Ouachita Mountains and just up the road from the Ouachita National Forest, a wood-burning fireplace is both practical and relevant. However, the idea of a smoke-belching fire to satisfy my emotional desires seems to run counter to my interest in saving the planet from smog, noxious gases, and firestorms. All of those things notwithstanding, I have been thinking about the fireplace and the comments made by the building inspector, who said “this fireplace can burn wood; it is properly vented, the chimney is in good condition, and you could easily shift from propane to wood.” I wonder if “easily” takes into consideration what it would take to secure cut wood, create a place to store it, move it into the house when needed, and clean the fireplace, the chimney, and the walls of soot. And I wonder whether the danger of a wood-fueled house fire fits into the “easily” equation. And cost? What about cost? Well, as I said, I have been thinking about the inspector’s comments. And although I have ample reason to dismiss them as the words of a madman, I have to admit I am a sucker for a wood fire. I love the smell of smoke. Wood fires ignite something in me that propane cannot hope to kindle. The real question, I suppose, comes down to several issues: how often would I have a fire in the fireplace? Does my wish for an environment such as I envision warrant the effort and expense? And, finally, will my wife veto the idea, or simply dismiss it as the fantasy of a geezer who just happens to share her house? She is not as enamored of fire as I; fireplaces don’t do so much for her. Yes, I do have fantasies. I used to call them dreams. This entry was posted in Dreams, Just Thinking. Bookmark the permalink.